Director of the Education Policy Program at New America & author of The End of College on the future of learning. The information revolution is creating unprecedented new opportunities for learning. People will be able to earn college degrees for a fraction of today’s astronomical tuition prices, huge new markets will open up in education, and traditional schools and colleges will be challenged to adapt and survive. Colleges are under attack from parents and politicians worried about rising prices and new companies promising to offer web-based courses at a fraction of campus tuition. The rise of online education is a grave threat to the traditional college mission and business model. But it can also be an opportunity for institutions willing and able to embrace the digital future by expanding their reach to students around the world. Kevin Carey directs the Education Policy Program at New America. 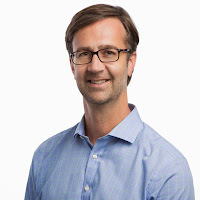 An expert on Pre-K-12 and higher education issues, Carey has published articles in The New York Times, Slate, The New Republic, Washington Monthly, The American Prospect, The Chronicle of Higher Education, and Democracy, among others. Carey's research includes higher education reform, improving college graduation rates, online education, community colleges, and the federal Elementary and Secondary Education Act. His writing was anthologized in Best American Legal Writing and has received two Education Writers Association awards for commentary. He appears frequently on media outlets including CNN, C-SPAN, and NPR. 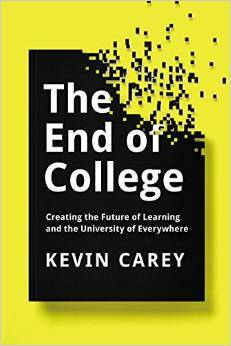 He is the author of The End of College: Creating the Future of Learning and the University of Everywhere. Prior to joining New America, Carey worked as the policy director of Education Sector, and as an analyst at the Education Trust and the Center on Budget and Policy Priorities. Previously, he worked for the Indiana Senate Finance Committee and as Indiana's Assistant State Budget Director. Carey is a graduate of Binghamton University and the Ohio State University. He lives with his wife and daughter in Washington, D.C.